According to California Safely Surrendered Baby (SSB) Law, parents or anyone with lawful custody of a child can safely surrender a baby to a staff member at a safe surrender location (which is any fire station or emergency room staff in Kern County) within 72 hours. Parents will then have a least 14 days to claim his or her infant. 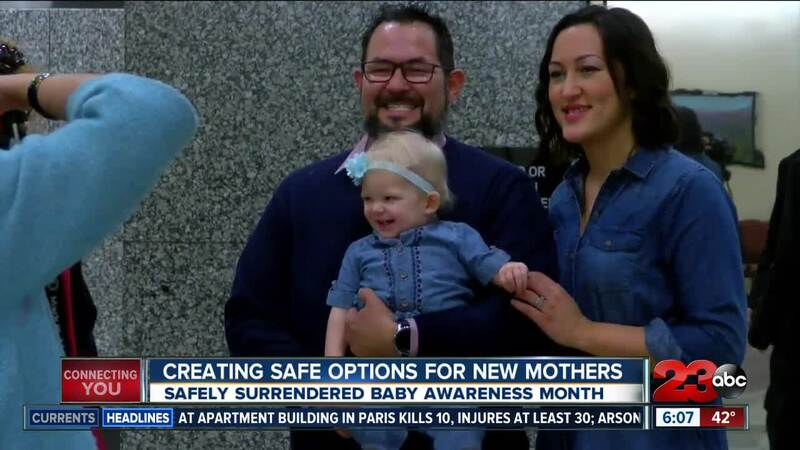 BAKERSFIELD, Calif. — Tuesday, the Board of Supervisors proclaimed February, Safely Surrendered Baby Awareness Month in Kern County. "It's important to continue to bring awareness, to the fact that women have an option. They have a choice when they are in crisis, they have a newborn baby, and they can't keep that baby," said Dena Murphy, the director of the Department for Human Services. According to the California Safely Surrendered Baby (SSB) Law, parents or anyone with lawful custody of a child can safely surrender a baby to a staff member at a safe surrender location (which is any fire station or emergency room staff in Kern County) within 72 hours. Parents will then have a least 14 days to claim his or her infant. The SSB law also, protects parents or surrendering person from prosecution for child abandonment and does not require that names be given when the baby is surrendered as long as it's surrendered in the hands of a staff member. According to the Safely Surrendered Baby Coalition, the purpose of the SSB Law is to protect babies from being hurt or killed because they were abandoned. "It takes a lot of courage for a mother, to have a baby and give a baby up. I want to thank the mothers for having the courage, to choose a different path for their child if they really can't take care of them. There are options, there are safe options," said Murphy. For more information visit www.babysafe.co.gov or see their information pamphlet.